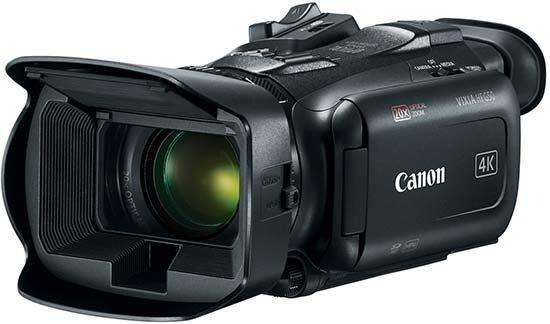 The Canon VIXIA HF G50 is the first Vixia G-series camcorder to feature 4K recording. Featuring a genuine wide-angle Canon 20x (29.3-601mm) optical zoom lens, the VIXIA HF G50 provides a well-rounded feature set at an affordable price point. The Canon VIXIA HF G50 4K UHD video camcorder is scheduled to be available in April 2019 for an estimated retail price of $1099. MELVILLE, N.Y., Jan. 7, 2019 – A versatile addition to the VIXIA G-series family of camcorders, Canon U.S.A. Inc., a leader in digital imaging solutions, today announced the Canon VIXIA HF G50. The camcorder is the first VIXIA G-series camcorder to feature 4K 30P recording and is an ideal tool for advanced amateur filmmakers, wedding videographers and student reporters. Featuring a genuine wide-angle Canon 20x (29.3-601mm)* optical zoom lens, the VIXIA HF G50 provides a well-rounded feature set at an affordable price point. *1 35mm equivalent. 4K UHD vibration proof OFF / Standard IS ON.